How can UK exporters network and make new contacts overseas? Going overseas, especially as a relatively new exporter, can be scary, difficult and exciting. Not only is it complicated trying to understand the new local market but it’s also hard, yet important, to build a new network to support one’s business and/or ambitions overseas. For most people, especially for small and medium enterprises (SMEs), limited resources can be a bit of a challenge. Even for a pretty large and established firm, who might be the most powerful player in their industry in the UK, upon entering a new market they usually have to start again from scratch. The UK export support ecosystem has a wide range of support mechanisms for British exporters. In the UK there is the Department for International Trade, with local offices across the UK to help new and experienced UK exporters, as well as offices in many of the British embassies and consulates overseas. In addition, there are various other support institutions, such as the Institute of Export and International Trade UK of course. But, in overseas markets, apart from the Department for International Trade officers that are based in the embassies and consulates, what other resources can British exporters tap into? A British Business Group (BBG) is essentially an association or club of expatriate British business people, though it can also include local and other nationalities working for firms that represent British goods or promote British exports. Aims of the group typically are to encourage trade with the host country, as well as providing a social environment for business networking. In the case of the United Arab Emirates there are two British Business Groups – one in Abu Dhabi and another one in Dubai. We take a look further and get a glimpse of the British Business Group in Abu Dhabi in this series. The capital and the largest emirate in the United Arab Emirates in terms of size, Abu Dhabi is a popular destination for British companies and expatriates. Only an hour and a half’s drive to Dubai, Abu Dhabi’s growth in recent memory shows opportunity and interest not only for British exporters but also other nationalities. Fuelled mainly by petroleum, as is most of the Gulf, Abu Dhabi is striving to create a diversified economy, particularly towards being a hub of culture, arts and education in the region. This is evident with the announcement of the Guggenheim and Louvre museums in Abu Dhabi, the latter now already open. 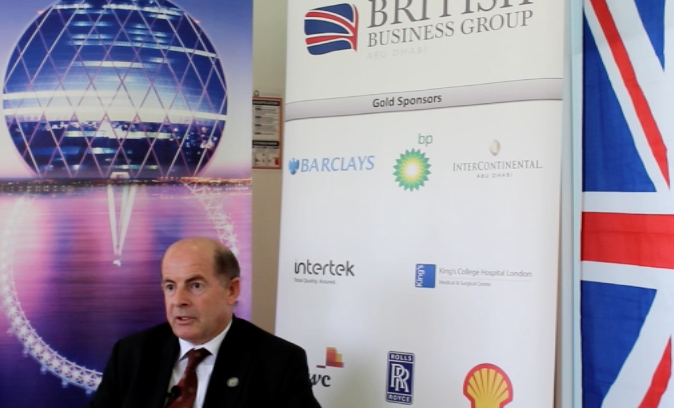 Watch my interview with Nick Cochrane-Dyet, chairman from the British Business Group Abu Dhabi.